Are you or is someone you know considering suicide? If tears could build a stairway and memories a lane, we’d walk right up to heaven and bring you home again. Most people that take their own lives exhibit one or more behavioral indicators evident in the things they say or do. Knowing how to recognize them in others can save lives. Question the person about suicide. Do they have thoughts, or plans of suicide? Don't be afraid to ask and take the initiative. Listen carefully. Then say "Let me help." Or "Come with me to find help." Refer for help. If a child or adolescent, contact an adult, a parent. Call a medical professional, your minister, rabbi, tribal elder, teacher, coach or counselor. Call the resource numbers on this website. Reach out. Asking the suicide question DOES NOT increase risk. Don't promise secrecy and don't worry about being disloyal. Call your mental health center, local hot-line, or emergency services. is a crucial part of prevention. given definitive clues of their intentions. They leave numerous hints and warnings to others, though some of their signals may be nonverbal or difficult to detect. Those who are thinking about suicide give clues as cries for help. Many seek someone to rescue them from their thoughts of suicide. It’s also vital for parents to know that the highest rates of suicide occur within about three months of an apparent improvement in a severely depressed state. An improved emotional mood doesn’t mean a decreased risk. The short dash between these dates represents so many wonderful, funny, special stories about this beautiful, smart, creative, caring young man. Joe and all the other beautiful children would have stayed longer if they could. To the outside world, Joe was an ordinary teenager. But inside, he was battling depression. It proved to be more horrible than any of his loved ones could imagine. Joe committed suicide at age 19. In a courageous effort to raise awareness and to prevent other families from experiencing the tremendous pain of losing someone to suicide, Dave Clements and his family – wife Carlynn and daughter Sarah - established the Joe Was Just Joe Foundation. Suicide is a permanent solution to a temporary problem. If we can get people the help they need, we can prevent suicide. Within just two days of Joe’s death, we knew we had to do something to tell others about suicide and to stop others from making the wrong decision. About one year later, the foundation began in 2009. We named it ‘Joe Was Just Joe,’ because we were always saying that, "Joe is Just Joe". Joe was a very unique person. For the past five years, we have visited schools and other organizations, and have assisted the La Crosse Area Suicide Prevention Initiative (SPI), a group that’s also worked diligently to raise awareness and hope in the community since 2004. 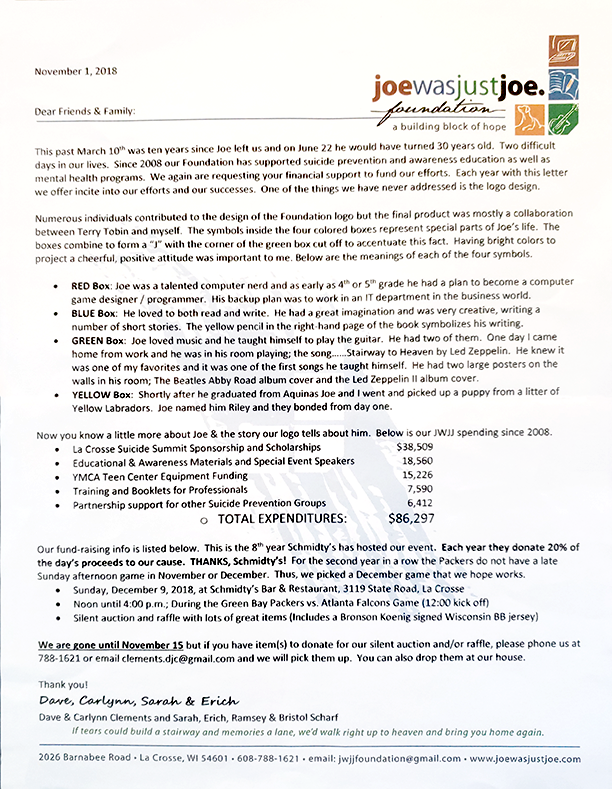 The Joe Was Just Joe Foundation helped to sponsor the first annual Suicide Summit, held for the past three years by SPI, along with an annual Suicide Awareness Walk each fall. Our foundation continues to be a major supporter of the summit. We also sponsor scholarships for people who want to attend the summit but cannot afford the registration fee. In 2013 we paid for 13 individuals to attend, many of who had lost a loved one to suicide.